Kindred Fare in Geneva, N.Y., has become a dining go-to for both locals and tourists. Wine Spectator's June 30, 2018, issue has just hit newsstands, and among the sea of rosé (from our cover story) is senior editor James Molesworth's latest tasting report on the Finger Lakes, and my profiles on four wineries that are advancing the region. I've visited the Finger Lakes a few times now, and I've been impressed with the quality of the wines and the dedicated vintners who make them. With wine lovers flocking to visit wineries and taste the local juice, dining options have also been on the rise. I've discovered some wonderful local eateries serving a variety of cuisines, from farm-to-table to Austrian to Southern—as well as piled up a long wish list for where to eat next. Seneca and Cayuga are the biggest lakes of the area. The former boasts the most well-regarded roster of wineries. The latter has the widest range of cultural offerings, mostly in the college town of Ithaca. To the west, the smaller, wishbone-shaped Keuka Lake has several wineries of its own. Parks with stunning waterfalls are also a worthwhile attraction. I discovered Kindred Fare, in Geneva, at the north end of the lake, completely by chance when I found myself in the town one evening and my go-to spots were operating on limited, off-season hours. (Beware of those, the winters here are pretty quiet.) For a back-up plan, it was pretty great. The spacious dining room houses an island bar and a semi-open kitchen, allying red brick and white tiles. The food is simple, fresh, seasonal and locally sourced—grouped under headers like "Butcher," "Fisherman," "Farmer and Forager"—and the wine list is well-curated and heavy on the Finger Lakes. 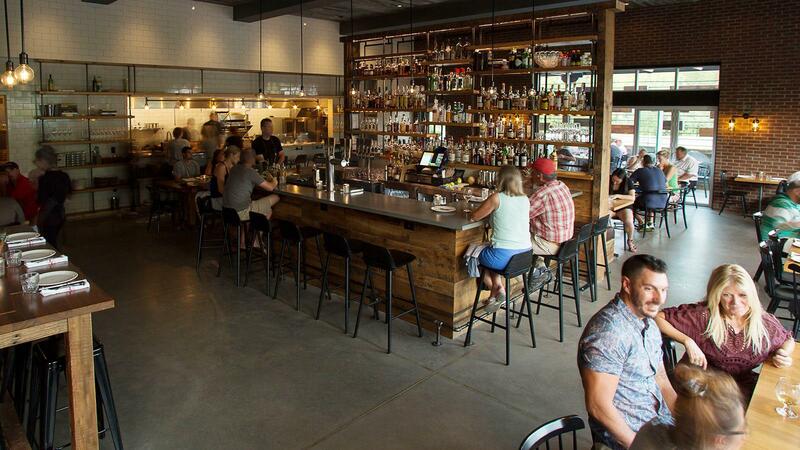 Kindred Fare is the type of restaurant you want to be a regular at. Microclimate, also in Geneva, is where the local cool kids—many who work at the wineries—come to unwind. In a small space tucked in the quaint and likewise small Linden Street, the bar has a concise three-page wine list that highlights Finger Lakes producers and some from California, with a smattering of international selections from Argentina, Italy and France, among others. Expect some fun oddballs, like a Finger Lakes Teroldego or a Nero d'Avola from Australia. The Viennese bento box at Dano's allows diners to sample several Austrian specialties, like sausage and spaetzle. If you're staying in the Watkins Glen area, south of Seneca Lake, head farther south to Harvest Café in Montour Falls for breakfast or brunch, out of the way from the main action. You'll find wood-paneled walls, kitschy plastic tablecloths and delicious comfort food. A great place to get the small-town vibe and be among locals. There's a hot dog underneath those onion rings (left) and this burger came with bacon and corn, among other stuffings. Up along the west side of Seneca Lake is FLX Wienery, in Dundee, a casual eatery run by local chef Christopher Bates and his wife, Isabel Bogadtke. This joint pulls no punches, offering all kinds of sausages like bratwurst, chorizo and Italian, and some of the most loaded hot dogs, burgers and fries I've ever seen. There's a small selection of beer, wine and spiked milkshakes. Next on my to-dine list: FLX Table and FLX Fry Bird, both part of the FLX Wienery family; the former is a 14-seat, fine-dining concept aiming to replicate a dinner party, and the latter is a brand-new joint dedicated to fried chicken. In Penn Yan, Top of the Lake is a bistro-style restaurant that serves your typical American surf-n-turf, pastas and sandwiches, alongside a basic wine list of mostly local wines. But the main draw is the view. Aptly named, Top of the Lake is located at the northern tip of Keuka, and offers a striking look out onto the lake's expanse. Be sure to make reservations and request the outdoor patio seating. Top of the Lake restaurant offers great views of Keuka Lake. In Ithaca, which is south of Cayuga Lake (east of Seneca) and home to Cornell University, head to Maxie's Supper Club for something a little different. In a large blue wood-framed house, the lively restaurant serves New Orleans cuisine with an emphasis on seafood, with dishes like chicken, andouille and crawfish gumbo, jambalaya and an extensive selection of po'boys. The bargain-priced wine list features local producers like Damiani and Standing Stone, among other international bottlings. Next on my to-dine list: Coltivare in Ithaca, a culinary center and the restaurant of the local Tompkins Cortland Community College; Just a Taste, also in Ithaca, a tiny tapas-style restaurant that's a favorite with locals.